Rabett Run: The climate news hook about record cold is that it doesn't happen much. Also, betting opportunities. The climate news hook about record cold is that it doesn't happen much. Also, betting opportunities. If the blue matched the red, then that might indicate a problem with our understanding of climate change. Occasional deviations, like what we're seeing now, doesn't change that. The years since 2010 have generally followed this pattern, although 2013 didn't. For one year out of the last 20, record cold exceeded record warmth, but this decade is running at a ratio of 3:1 overall between record highs and record lows. If someone thinks 2014 is likely to have more record cold than warm, let's do a bet. Meanwhile, data for the other 98% of the earth's surface would be nice. I probably just haven't looked hard enough. I did find this paywalled Coumou/Robinson/Rahmstorf abstract saying in our warming world record heat is happening five times as often as you'd expect in a non-warming world, so it seems likely there's at least a similar large disparity in heat to cold record ratios worldwide. UPDATE: thanks to Steve Bloom in the comments (and Eli) for finding unpaywalled versions of the Coumou et al. piece. The full article doesn't address cold records, but it clearly shows the ratio of heat records is off the hook because of global warming. And per Daniel Wirt in the comments, the climate change effect of a warming Arctic could be shifting the location of the cold, causing our current cold records. Well here in Europe, we've been having a pretty mild winter, with some record highs especially on the Mediterranean. And I hear that Argentina and Australia are having some pretty hot weather, too. "record-breaking cold doesn't happen nearly as often as record-breaking warmth"
the most recent year on record. Yay! Eunice picked her cherries! One year and ... one country!!!! AT: how long till the first "nasty warmists want to beat us up!" bumgravy from the glass-jawed twats at WUWT? place bets now! NotARedneck: yeah, if it weren't for the regular downpours, it'd be almost t-shirt weather here in the UK. not bad for January! Thanks Steve and Daniel, I've added an update. Yes, Eunice, I specifically called out 2013 in the OP. "...the climate change effect of a warming Arctic could be shifting the location of the cold, causing our current cold records." There is a lack of data and two points don't make a trend. But some of us are old enough to recall the winter of 78/79. Clearly, that winter ( the coldest North American winter on record ) incurred a lot of 'polar vortex wobble'. 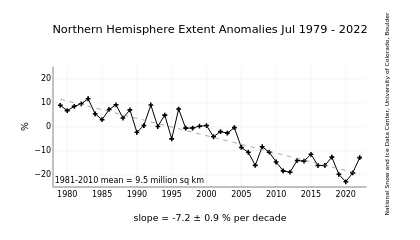 But it also had the largest amount of Arctic sea ice for the period of record since then. Blaming wave amplification on lack of Arctic ice when it clearly occurred at an even greater extent with a surplus of Arctic ice should have those who are still thinking asking questions. Of course, meteorologists could have told you a lot about the fact that most 'Arctic Air Masses' form over the land of Siberia, Canada, and Greenland ( positive water vapor feedback, and all ) and not over the Arctic Ocean. They could have also told you about the 'Index Cycle' wherein zonal and meridional flow are at odds with one another. Zonal flow tends to amplify gradients, meridional flow tends to weaken gradients ( because of exchange ). There is a negative feedback between the two states, and 78/79 notwithstanding, neither state is likely to persist. The whole notion looks like yet another rabbit hole. Last anon has the typical denialist problem of understanding that natural factors and artficial factors may have similar effects. It's noon right now, and my house is warmer than it was a few hours ago. That could be because the heat was turned on, or because it's warmer now outside, or some combination. Weird weather can be caused by natural variation or by artificial effects from climate change. The wandering jet stream because of a warming Arctic seems plausible to me although it would take more work to get it to a high level of certainty. 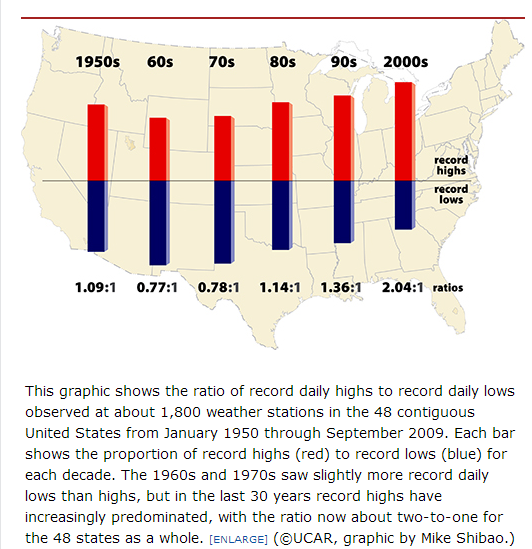 The ratio of hot to cold records is rock solid, and something denialists refuse to address. At the very least, a severe arctic cold blast in the US is not incompatible with global warming (despite people like Rush Limburger promoting the opposite). When natural variation is sufficient, Occam's razor should cut off speculative alternatives. "The month of December was one of the mildest in a century in the Nordic countries, according to meteorologists, with temperatures exceeding their normal seasonal average by four to five degrees Celsius in Norway and Finland. This year began in a similar vein: pavements in all the Scandinavian capitals were uncharacteristically free of ice and snow, with the white stuff appearing only briefly in Oslo and Stockholm in early December. Swedish daily Dagens Nyheter said several types of migratory birds have yet to leave for warmer climes, and showed cherry blossoms that normally only appear in the spring." I'll bet you ten ounces of gold that globally in 2015 there will be more warm records than cold ones. Offer good for one week from now. Terms if you express interest. Come on Eunice, it's only a measly ten ounces of gold!